Anna built her professional career in beauty and luxury marketing, working with big brands such as Dolce & Gabbana, Hugo Boss and Burberry. Today, she continues to write, consult and train businesses on how to build powerful brands and effective marketing strategies, and how best to implement these in their organisation. As a coach, she now works individually with a select number of clients to help them ‘reimagine success’ in their personal and professional lives. She also runs a group programme where she supports professionals who want to take their One Step Outside the 9 to 5. 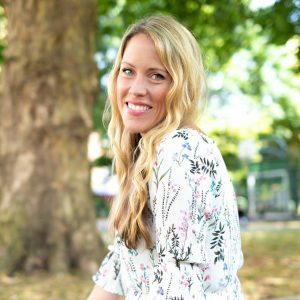 Anna is a confident speaker and workshop facilitator as well as a published writer, with articles appearing on online publications including Business Insider, Inc. Magazine and Thrive Global, and co-authoring the book How To Succeed In Your First Job. I always wanted to *be* a writer. Growing up, I created a pretend newspaper where I interviewed my dad (fake news actually, as I made up his answers!) and I also wrote some pretty awful Sweet Valley High-type teen romance stories. I didn’t study English at university, but I did study Politics and Economics and I thought that was a great basis for going into journalism. Although I didn’t pursue it professionally on graduation, I did a lot of courses, from a magazine journalism course with the National Council for the Training of Journalists (NCTJ) to many mini-creative writing courses. It was when I took my sabbatical in 2013 and travelled across South America that I launched a blog and began writing publicly for the first time. This gradually evolved from the personal travel diary that it had started out as to increasingly reflect my musings on career choices and personal development, and ultimately it became a platform for my business. This has been an organic process from the start, where I have written about whatever I was interested in at the time, but I have focused my work in the past couple of years to be more intentionally designed to support my clients and grow my business. I’ve been publishing weekly on my blog for years (in fact, I started out with a new post every two days when I was travelling and then continued twice weekly) and that’s an integral part of my routine at this stage. I also now write for external publications so that has become a regular outlet, while I use my marketing and business experience to produce training scripts for a number of companies as well. As a result, I write something pretty much every day. Although I never really face that dreaded “writer’s block”, there are definitely days when I feel inspired and can push out a great blog post in just a couple of hours, and other days when I just don’t have the energy or focus. The good thing is that there are plenty of other things that I can be doing on those days, that require a different kind of brain work! Write! So many of us talk about wanting to “be a writer”, and yet we don’t do what being a writer essentially requires: writing! Writing every day, putting our work out there, and keeping going, whatever the response (or lack thereof). Don’t worry about getting it wrong – you’re not going to nail the very first post that you write, and you’re unlikely to be a bestseller with your very first book. Write, publish, then write again. That’s the only way that you’ll be a writer – and get better at your craft. The other piece of advice is to define what success means to you. Do you have to be a New York Times bestseller in order to feel like a writer? Do you have to sell a million copies? Do you want your book to be a step in your marketing funnel for your business? A platform that will give you credibility and help you enter a career of public speaking? Or just a passion project that you simply have to get out of your system? Knowing why you want to write will first of all keep you motivated through the lows but secondly also help you decide on the best topic and the right way to go about the whole process. My first book was a project with a former colleague, where we wanted to collect all the things that we had learned in our ten years of corporate experience, along with expert advice from people in our network, in a guide to help new hires. My second book, just launched, is also a collection of wisdom and personal experiences: it’s 50 stories of people who have left behind the corporate 9 to 5 to create a different kind of career and life for themselves. I’ve framed these stories within my own experience of quitting my job and I’m hoping this will prove reassuring, inspirational and of tangible help to people who are considering their very own career transition. I think the possibilities brought about by self-publishing are incredible. So many people dream of writing a book and now it’s no longer a pipe dream but a very feasible proposition. However, for self-publishing to thrive, I think it’s important that independent publishers approach the whole project with professionalism, using professional editors, book cover designers, and so on, to ensure a high quality for the reader and to further the industry as a whole.